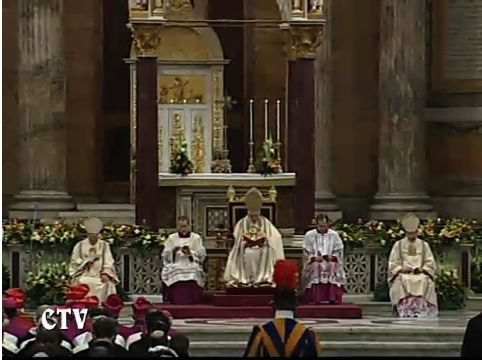 ROME, JAN. 25, 2011 (Zenit.org).- Here is a translation of the homily Benedict XVI delivered today at the closing vespers of the Week of Prayer for Christian Unity, held at the Basilica of St. Paul’s Outside the Walls. Today’s feast of the Conversion of St. Paul brought the prayer week to a close. Following the example of Jesus, who on the eve of his Passion prayed to the Father for his disciples “that they may all be one” (John 17:21), Christians continue to invoke incessantly from God the gift of this unity. This request is made more intense during the Week of Prayer, which ends today, when the Churches and ecclesial Communities meditate and pray together for the unity of all Christians. This year the theme offered for our meditation was proposed by the Christian communities of Jerusalem, to which I would like to express by heartfelt gratitude, accompanied by the assurance of affection and prayer either on my part or on that of the whole of the Church. The Christians of the Holy City invite us to renew and reinforce our commitment for the re-establishment of full unity meditating on the model of life of the first disciples of Christ gathered in Jerusalem: “They — we read in the Acts of the Apostles (and we heard it now) — devoted themselves to the Apostles’ teaching and fellowship, to the breaking of bread and the prayers” (Acts 2:42). This is the portrait of the early community, born in Jerusalem the same day of Pentecost, aroused by the preaching of the Apostle Peter, full of the Holy Spirit, addressed to all those who had arrived in the Holy City for the feast. A community not shut-in on itself, but, from its birth, catholic, universal, capable of embracing people of different languages and cultures, as the book of the Acts of the Apostles itself testifies. A community not founded on a pact among its members, or the simple sharing of a project or an ideal, but from profound communion with God, who revealed himself in his Son, from the encounter with Christ dead and resurrected. In a brief summary, which ends the chapter that began with the account of the descent of the Holy Spirit on the day of Pentecost, the Evangelist Luke presents synthetically the life of this first community: how many had heard the word preached by Peter and were baptized, listened to the Word of God, transmitted by the Apostles; were happily together, taking charge of the necessary services and sharing freely and generously their material goods; celebrated the sacrifice of Christ on the Cross, his mystery of Death and Resurrection, in the Eucharist, repeating the gesture of the breaking of the bread; they continually praised and thanked the Lord, invoking his help in their difficulties. This description, however, is not simply a memory of the past, and even less the presentation of an example to imitate or of an ideal goal to reach. It is rather the affirmation of the presence and action of the Holy Spirit, uniting all in Christ, who is the principle of the unity of the Church and makes believers one. The teaching of the Apostles, fraternal communion, the breaking of the bread and prayer are the concrete ways of life of the first Christian community of Jerusalem gathered by the action of the Holy Spirit but at the same time they constitute the essential features of all Christian communities, of all times and all places. In other words, we can also say that they represent the essential dimensions of the unity of the visible Body of the Church. We must be grateful because, in the course of the last decades, the ecumenical movement, “arising from the impulse of the grace of the Holy Spirit” (“Unitatis Redintegratio,” No. 1), has taken significant steps forward, which have made it possible to attain encouraging convergence and consent on varied points, developing between the Churches and the ecclesial communities relations of mutual esteem and respect, as well as of concrete collaboration in face of the challenges of the contemporary world. We are well aware, however, that we are still far from that unity for which Christ prayed and which we find reflected in the portrait of the first community of Jerusalem. The unity to which Christ, through his Spirit, calls the Church is not realized only on the plane of organizational structures, but is configured, at a much more profound level, as expressed “in the confession of only one faith, in the common celebration of divine worship and in the fraternal concord of the family of God” (ibid., No. 2). The search for the re-establishment of unity among divided Christians cannot therefore be reduced to a recognition of the reciprocal differences and to the obtaining of a peaceful coexistence: What we long for is that unity for which Christ himself prayed and which by its nature is manifested in the communion of the faith, of the sacraments, of the ministry. The path toward this unity must be seen as a moral imperative, response to a precise call of the Lord. Because of this, the temptation must be overcome to resignation and pessimism, which is lack of trust in the power of the Holy Spirit. Our duty is to continue passionately on the path towards this goal with a serious and rigorous dialogue to deepen the common theological, liturgical and spiritual patrimony; with reciprocal knowledge, with the ecumenical formation of the new generations and, above all, with conversion of heart and prayer. In fact, as Vatican Council II declared, the “holy intention to reconcile all Christians in the unity of the one Church of Christ, surpasses human forces and talents” and, because of this, our hope is placed first of all “in the prayer of Christ for the Church, in the Father’s love for us and in the power of the Holy Spirit” (ibid., No. 24). On this path for the search of full visible unity among all Christians we are accompanied and sustained by the Apostle Paul, of whom today we celebrate solemnly the feast of his conversion. He, before the Risen One appeared to him on the road to Damascus saying to him: “I am Jesus whom you are persecuting!” (Acts 9:5), was one of the most ferocious adversaries of the early Christian communities. The evangelist Luke describes Saul among those who approved the killing of Stephen, in the days when a violent persecution broke out against Christians of Jerusalem (cf. Acts 8:1). He left from the Holy City to extend the persecution of Christians to Syria and, after his conversion, he returned to be introduced to the Apostles of Barnabas, who made himself guarantor of the authenticity of his encounter with the Lord. From then on Paul was admitted not only as a member of the Church but also as preacher of the Gospel together with the other Apostles, having received, as them, the manifestation of the Risen Lord and the special call to be “chosen instrument” to carry his name before the Gentiles (cf. Acts 9:15). In his long missionary journeys, Paul, journeying through different cities and regions, never forgot the bond of communion with the Church of Jerusalem. The collection in favor of Christians of that community, who, very soon, had need of being helped (cf. 1 Corinthians 16:1), occupied an important place in Paul’s concerns, which he considered not only a work of charity, but the sign and the guarantee of the unity and the communion between the Churches founded by him and the early community of the Holy City, as sign of the one Church of Christ. 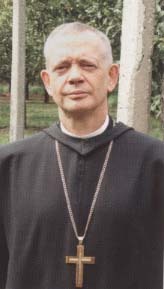 In this climate of intense prayer, I wish to address my cordial greeting to all those present: to Cardinal Francesco Monterisi, archpriest of this Basilica, to Cardinal Kurt Koch, president of the Pontifical Council for Promoting Christian Unity, to the other cardinals and brothers in the episcopate and priesthood, to the abbot and to the Benedictine monks of this ancient community, to men and women religious, to the laity that represent the entire diocesan community of Rome. In a special way, I would like to greet the brothers and sisters of the other Churches and ecclesial communities represented here this evening. Among them, it is particularly gratifying to me to address my greeting to the members of the International Mixed Commission for Theological Dialogue between the Catholic Church and the Ancient Eastern Churches, whose meeting will take place here in Rome in the next few days. Let us entrust to the Lord the good outcome of your meeting, so that it can represent a step forward toward the much hoped for unity. Dear brothers and sisters, trusting in the intercession of the Virgin Mary, Mother of Christ and Mother of the Church, we invoke, therefore, the gift of unity. United to Mary, who on the day of Pentecost was present in the Cenacle together with the Apostles, we turn to God source of every gift to have renewed for us today the miracle of Pentecost and, guided by the Holy Spirit, may all Christians re-establish full unity in Christ. Amen. The year officially started with a week of orientation activities at the Lay Centre, with the community half comprised of returning residents and half of new members. Robert White, our assistant director and patristic scholar, lead a couple of guided walks around the city and the neighbourhood. House meetings included topics ranging from the sharing of life and responsibilities, prayer in community to living with diverse faith traditions and the psychology of building healthy community life. Felix Körner, SJ and Tim Costello, SM of the Gregorian joined us on different nights to add their wisdom to the discussions. The church, it is interesting to note, has two main altars on the axis, over which are depictions of the martyrdom of St. Peter on one end and St. Paul on the other. 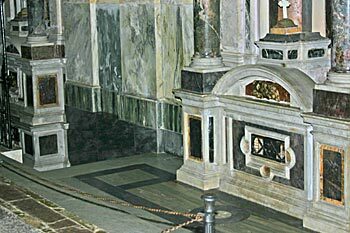 Even here in this place of the martyrdom of Paul, his co-patron of Rome seems to have gained the upper hand as all the chairs are oriented to the altar of Peter rather than Paul! Three churches and a retreat centre share the grounds with the Cistercian abbey. In addition to the Church of San Paul of the Three Fountains are the abbey church of Sts. Anastasias and Vincent, and the church of Santa Maria Scala Coeli. The Benedictines and the Trappists are both involved in various ways with the site, which includes among its various activities the raising of the sheep which are shorn on St. Agnes’ Day to prepare the pallia presented to Metropolitans on the Feast of Sts. Peter and Paul by the bishop of Rome. Abbot Edmund Power, OSB, lead our day of prayer and reflection around the theme of Hospitality as Spirituality according to St. Paul and to St. Benedict. Hospitality is reciprocal, not just social but sacred. This can be missed in the host-guest relationship in English, but in Italian the same word is used for both: Ostpite. Recieving hospitality is as sacred a duty as offering it. Paul’s observations that “All is Grace” indicates that following the law is insufficient, we must rely on one another. Little wonder the semitic cultures put such emphasis on hospitality. Welcome anyone who is weak in faith, but not for disputes over opinions. One person believes that one may eat anything, while the weak person eats only vegetables. The one who eats must not despise the one who abstains, and the one who abstains must not pass judgment on the one who eats; for God has welcomed him. Who are you to pass judgment on someone else’s servant? Before his own master he stands or falls. And he will be upheld, for the Lord is able to make him stand. We have spoken frankly to you, Corinthians; our heart is open wide. You are not constrained by us; you are constrained by your own affections. As recompense in kind (I speak as to my children), be open yourselves. Still, it was kind of you to share in my distress. You Philippians indeed know that at the beginning of the gospel, when I left Macedonia, not a single church shared with me in an account of giving and receiving, except you alone. For even when I was at Thessalonica you sent me something for my needs, not only once but more than once. It is not that I am eager for the gift; rather, I am eager for the profit that accrues to your account. I have received full payment and I abound. I am very well supplied because of what I received from you through Epaphroditus, “a fragrant aroma,” an acceptable sacrifice, pleasing to God. My God will fully supply whatever you need, in accord with his glorious riches in Christ Jesus. To our God and Father, glory forever and ever. Amen. We concluded with a reading and observations on the Rule of Benedict, chapter 53, which deals with the “Reception of Guests”. Benedict describes a formal, sacramental act of welcoming a guest and describes the balance between keeping the life of the community going yet making exceptions to fasting and other norms in order to make the guest be welcome. The priority he gives is clear: First the poor and pilgrims, with whom Christ is particularly received, then brothers in the faith, and others. The closing of the very busy Week of Prayer for Christian Unity every year in Rome is the Papal Ecumenical Vespers (Evening Prayer) at the Patriarchal Basilica of St. Paul Outside the Walls. Built over the tomb of St. Paul, re-confirmed by tests revealed at the end of the Year of Paul last summer, and administered by Abbot Edmund Power and the Benedictine Abbey there, the basilica is known for its ecumenical significance. In fact, it was at the end of this very service on 25 January 1959, closing the Week of Prayer for Christian Unity, that Pope John XIII announced his intention to convene the Second Vatican Council, making very clear that ecumenism was to be one of the major themes of the council, along with the aggiornamento of the Church and a reconciled engagement with the modern world. This year, probably Cardinal Walter Kasper’s last as President of the Pontifical Council for Promoting Christian Unity, Pope Benedict XVI made special note of the 100th anniversary of the 1910 World Missionary Conference in Edinburgh, which marks the beginning of the modern ecumenical movement. The basilica is outside the walls of the historic city centre, but only a few stops away by metro. Between exams and bad weather, and limited tickets, only a few of us from the Lay Centre were able to attend: Andrea, an Italian canon law student; Anna, our New Zealand liturgy student, and myself in one section; with our three Orthodox housemates Theodosius, Dimitrios, and Radmilo, escorted to the front as scholars of the Pontifical Council for Christian Unity. The readings and prayers of intercession were all offered by ecumenical guests and leadership, including the Archbishop of Canterbury’s permanent representative to the Holy See, Very Rev. David Richardson of the Anglican Centre in Rome. The Holy Father’s homily is included in full below. Gathered together in this fraternal liturgical assembly, on the Feast of the Conversion of St Paul, today we conclude the annual Week of Prayer for Christian Unity. I greet all of you warmly, in particular Cardinal Walter Kasper, President of the Pontifical Council for Promoting Christian Unity, and the Archpriest of this Basilica, Archbishop Francesco Monterisi, along with the Abbot and the Community of monks whose guests we are. I also extend my cordial thoughts to the Cardinals here present, to the Bishops and to all who represent the Churches and ecclesial Communities of this City who are here today. Only a few months have passed since the conclusion of the Year dedicated to St Paul, which gave us an opportunity to deepen our awareness of his extraordinary work as a preacher of the Gospel and also of our call to be missionaries of the Gospel, as the theme of the Week of Prayer for Christian Unity reminds us “You are witnesses of these things” (Lk 24: 48). Paul, although he retained an intense memory of his own past as a persecutor of Christians, did not hesitate to call himself an Apostle. For him, the basis of that title lay in his encounter with the Risen One on the road to Damascus, which also became the beginning of his tireless missionary activity. In this he was to spend every ounce of his energy, proclaiming to all the peoples the Christ whom he had met personally. Thus Paul, from being a persecutor of the Church, was in his turn to become a victim of persecution for the sake of the Gospel to which he witnessed: “Five times I have received at the hands of the Jews the forty lashes less one. Three times I have been beaten with rods; once I was stoned…. On frequent journeys, in danger from rivers, danger from robbers, danger from my own people, danger from Gentiles, danger in the city, danger in the wilderness, danger at sea, danger from false brethren; in toil and hardship, through many a sleepless night, in hunger and thirst, often without food, in cold and exposure. And, apart from other things, there is the daily pressure upon me of my anxiety for all the churches” (2 Cor 11: 24-25, 26-28). Paul’s witness reached its culmination in his martyrdom when, not so far from here, he was to give proof of his faith in Christ who conquers death. The dynamic of Paul’s experience is clearly expressed in the pages of the Gospel that we have just heard. The disciples of Emmaus, after having recognized the Risen Lord, return to Jerusalem and find the Eleven gathered together with the others. The Risen Christ appears to them, comforts them, overcomes their fear and doubts, and eats with them. Thus he opens their hearts to the intelligence of the Scriptures, recalling what had to happen, which would constitute the nucleus of the Christian proclamation. Jesus affirms: “Thus it is written, that the Christ should suffer and on the third day rise from the dead, and that repentance and forgiveness of sins should be preached in his name to all nations, beginning from Jerusalem” (Lk 24: 46-47). These are the events to which the disciples of the first hour were to bear witness, followed by believers in Christ of all times and places. It is important, however, to emphasize that this witness, then just as now, is born from the encounter with the Risen One, is fed by a constant relationship with him and animated by a profound love for him. One can only be his witness if one has had the experience of feeling Christ alive and present “See my hands and my feet, that it is I myself” (Lk 24: 39) of sitting at table with him, of listening as he sets one’s heart aflame! For this, Jesus promises his disciples and each of us a powerful aid from on high, a new presence, that of the Holy Spirit, gift of the Risen Christ, who guides us to the whole truth: “And behold, I send the promise of my Father upon you” (Lk 24: 49). The Eleven were to spend their whole lives proclaiming the Good News of the death and Resurrection of the Lord. Almost all of them were to seal their witness with the blood of martyrdom, a fertile seed that has produced an abundant harvest. The choice of the theme of this year’s Week of Prayer for Christian Unity the invitation, that is, to a common witness of the Risen Christ in accordance with the mandate he entrusted to his disciples is linked to the memory of the 100th anniversary of the Edinburgh Missionary Conference, in Scotland, widely considered a crucial event in the birth of the modern ecumenical movement. In the summer of 1910, in the Scottish capital, over 1,000 missionaries from diverse branches of Protestantism and Anglicanism, who were joined by one Orthodox guest, met to reflect together on the necessity of achieving unity in order to be credible in preaching the Gospel of Jesus Christ. In fact, it is precisely this desire to proclaim Christ to others and to carry his message of reconciliation throughout the world that makes one realize the contradiction posed by division among Christians. Indeed, how can non-believers accept the Gospel proclamation if Christians even if they all call on the same Christ are divided among themselves? Moreover, as we know, the same Teacher, at the end of the Last Supper, had prayed to the Father for his disciples: “That they may all be one… so that the world may believe” (Jn 17: 21). The communion and unity of Christ’s disciples is therefore a particularly important condition to enhance the credibility and efficacy of their witness. Now a century after the Edinburgh event, the intuition of those courageous precursors is still very timely. In a world marked by religious indifference, and even by a growing aversion to the Christian faith, it is necessary to discover a new, intense method of evangelization, not only among the peoples who have never known the Gospel but also among those where Christianity has spread and is part of their history. Unfortunately, the issues that separate us from each other are many, and we hope that they can be resolved through prayer and dialogue. There is, however, a core of the Christian message that we can all proclaim together: the fatherhood of God, the victory of Christ over sin and death with his Cross and Resurrection, and faith in the transforming action of the Spirit. While we journey toward full communion, we are called to offer a common witness in the face of the ever increasingly complex challenges of our time, such as secularization and indifference, relativism and hedonism, the delicate ethical issues concerning the beginning and end of life, the limits of science and technology, the dialogue with other religious traditions. There are also other areas in which we must from now on give a common witness: the safeguard of Creation, the promotion of the common good and of peace, the defense of the centrality of the human person, the commitment to overcome the shortcomings of our time, such as hunger, poverty, illiteracy, and the unequal distribution of goods. The commitment to unity among Christians is not the work of a few only, nor is it an incidental undertaking for the life of the Church. Each one of us is called to make his or her contribution towards the completion of those steps that lead to full communion among the disciples of Christ, without ever forgetting that this unity is above all a gift from God to be constantly invoked. In fact, the force that supports both unity and the mission flows from the fruitful encounter with the Risen One, just as was the case for St Paul on the road to Damascus, and for the Eleven and the other disciples gathered at Jerusalem. May the Virgin Mary, Mother of the Church, grant that her Son’s desire may be fulfilled as soon as possible: “That they may all be one… so that the world may believe” (Jn 17: 21). I nearly forgot it was Halloween yesterday without all the candy and pumpkins in the stores; barely any orange or brown to be found in the city. Apparently, it has not been a big holiday for Romans, or Italians in general. The big costume holidays are Epiphany, where they tend to dress up as La Befana, a gift-delivering witch who visits on January 6, and Carneval. A small group of us went out for an evening passagata around the Pantheon and Piazza Navona, stopping for gelato en route, and finishing with a nice bottle of wine at a little wine bar/café. We saw a few Befana hats out early, but really it was only as we were heading home for the night, about midnight, that we saw more people in costume. For the morning of All Saints, I opted for the Basilica San Paolo fuori la mura (St. Paul Outside the Walls). Rezart, one of my Muslim housemates, is working on a paper about the Eucharist, and he decided to join me so he could compare his first mass experience from Wednesday night here in the Lay Centre to a more formal experience at the Basilica. An added bonus is that Abbot Edmund was presiding at both liturgies, so the difference in personal presider styles could be taken out of the equation. Matthew joined us on location, in exchange for a visit to his parish next week, to which I am looking forward. St. Paul’s is the huge basilica built over the tomb of St. Paul, outside the old city walls (hence the name), one of the four major basilicas. Until the new St. Peter’s was built (1506-1625), St. Paul’s was the largest church in the world. Along the walls are the images of the bishops of Rome going back to Peter – the source for those posters one finds all over the place. 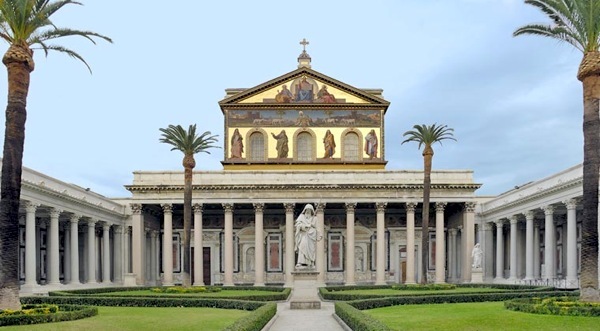 St. Paul’s has also become significant in Rome’s ecumenical efforts, including being the location of the culminating liturgy for the Week of Prayer for Christian Unity each year. In fact, it was from the steps of St. Paul’s that John XIII announced Vatican II at the end of the celebration for Christian Unity 50 years ago. Afterwards, Abbot Edmund was generous enough to meet with Rezart and me to answer questions and show us around a little. It is a gift to share the liturgy with someone experiencing it for the first time, especially someone so interested in learning about our worship. The questions remind us of the theology and symbolism we take for granted, and push for better understanding of what we might do out of habit. His first question was like this, he wanted to know why, if the Eucharist itself was a sacrifice made for the forgiveness of sins, why we had a penitential rite just a little while before celebrating the once-and-for-all penitential act! From there we ventured into the symbolism of serving only one species or both, the meaning of incense, and expansion from the homily and so on. It was a blessing for me to just listen! After returning to the Lay Centre for lunch and a little homework, we ventured out again to All Saints Anglican, to celebrate their patronal feast, and to cheer on Stian who had his acolyting debut. Nine of us in total joined the small English community fro Evensong, then ventured to a pizzeria founded in 1753 (according to the waitress’ t-shirt anyway) and located just down the road, near San Clemente. Donna assured us in advance it was the best pizza in Rome, and we were not disappointed! “Two monks were walking along in the woods one day, some time ago. As they approached a stream swollen with spring rains, they came across a woman clearly wanting to cross, but afraid to do so because of the strength of the flooded river. “According to the rule of the order, these monks were prohibited from speaking to women – and certainly from touching a woman. After a brief pause, one monk looked at the other and said, “Ah well”. He then asked the woman if she needed assistance across the river. She eagerly accepted, and he carried her across, with his brother monk following behind. On the other bank, the first monk let the woman down, and she went on her way, in a different direction than the two brothers. The guest presider and speaker for our community evening tonight was the Right Reverend Edmund Power, Abbot of the Benedictine Abbey at the Major Basilica of St. Paul Outside the Walls. And it was with this story that he opened a discussion on what it means to be a monk. A monk is a man (as a nun is a woman) who stands in the night with arms outstretched waiting for the dawn – and of course the dawn in Christ. Unlike some of these “modern” orders – like the Franciscans (founded c. 1210) or the Jesuits (founded c.1534) the primary charism of a monastic order like the Order of Saint Benedict (founded c.529) is not a particular work or ministry, but the interior life of prayer and purification of the soul. This is not to label one order as contemplative, so as to insist that others are not, or to suggest that activity is not involved in the life of a monastic. For of course, monks need work to support their life, but each monastery does whatever work is suitable to it – some farm, others make wine or chocolates, and the Abbey of St. Paul Outside the Walls serves the needs of the Basilica, mostly the pastoral and practical needs of pilgrims. Each of the major basilicas has a Cardinal Archpriest who is, at least nominally, responsible to be patron of the basilica and an advocate for its upkeep and other needs. The most (in)famous is of course the Cardinal Archpriest of St. Mary Major, Bernard Law. What was news to me is that until four years ago, St. Paul Outside the Walls did not have a Cardinal Archpriest. The reason being that, historically, the archpriest position was created only after the religious order at each basilica closed or withdrew from service, the last being St. John Lateran several hundred years ago. During that time, there has remained a Benedictine abbey at St. Paul outside the Walls, and the Abbot has been the equivalent of the Archpriest. With the election of Pope Benedict, however, an archpriest has also been named to St. Paul. (It was the first cardinal archpriest who commissioned the minor excavations that were announced at the close of the Pauline year this summer confirming the presence of first-century remains in the sarcophagus believed to be St. Paul.